Here is David McCandless' take: a balance of interestingness, function, form, and integrity. Affordances: In the field of design, experts speak of things having affordances - characteristics that reveal how they're to be used. A teapot has a handle. A door that you push has a push plate. The design of an object should, in and of itself, suggest how the object should be used. The same is true of your graphs, tables, and slides. Lead your audience through your visual – make it easy on them! Provide a visual hierarchy of information, these are visual cues for your audience so they know where to direct their attention. Accessibility: Designs should be usable by people of diverse abilities. Example of good design by this measure are Apple products: my mother can barely send an email, but put her iPhone or iPad in her hand and it's so intuitive that she doesn't feel overwhelmed by the technology. Work to make your data visualizations similarly straightforward and easy to use. Don't overcomplicate. Use text to label, introduce, explain, reinforce, highlight, recommend, and tell a story. Aesthetics: People perceive more aesthetic designs as easier to use than less aesthetic designs whether they are or not. Specifically, studies have shown that more aesthetic designs are perceived as easier to use, more readily accepted and used over time, promote creative thinking and problem solving, and foster positive relationships, making people more tolerant of problems with design (this is crazy, right? leverage it!). Use a pleasant color palette (personally, I tend to do everything in shades of grey with strategic, explicit use of bright blue to draw my audience's eye). Bring a sense of visual organization to your design (preserve margins, align things visually), showing attention to detail and a general respect for your work and for your audience. 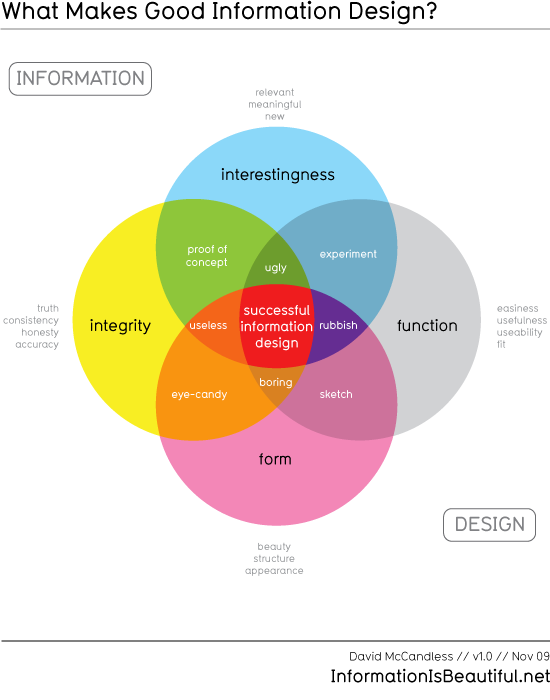 What do you think of these descriptions of effective information design? What makes good data visualization from your perspective? Leave a comment with your thoughts.